Are you looking for relief from the sun in your Bee Cave home? The Austin Shade Team knows firsthand how hard the Texas summer heat can be on you (and your energy bill). That’s why we decided to provide the ultimate solution: Solar window screens. Our solar window screens are guaranteed to last and provide your home with maximum comfort and can even help reduce your energy costs throughout the summer months. Our solar screens can be customized to fit any size, shape, and color of your window and frame. How do we guarantee the quality of our products? Well, we manufacture and install all of our window screens and solar shades. When you buy from us, you know you’re getting quality products, customer service, and prices! 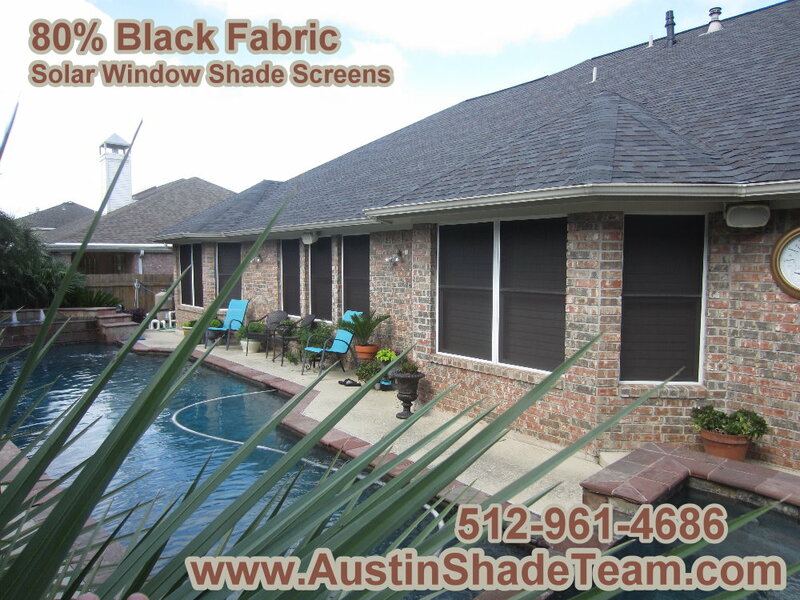 Contact the Austin Shade Team today to get shade relief for your Bee Cave property! Our solar window screens are second to none. Our window screens are custom fitted to match the shape and size of your window, whether it’s rectangular, circular, or other. These shown in this picture are all made out of the 80% fabric. All of these solar window screens for this home we made out of the black 80% Fabric and white framing. You can see by looking at these pictures that with this 80% fabric, you can see a little past the fabric and see the wood shutters there on the inside of those windows. That right there shows you that there is some transparency for the 80% fabric. Unlike window tinting, which only provides shade for the rays inside the home, our Austin TX solar window screens actually provide shade for the glass and window to reduce heat coming in. Here’s an example of us using the chocolate 80% solar window screen fabric with tan framing. This is us using this chocolate Fabric and tan frame solar screen on top of white window frames. We chose to use that tan frame solar screen because the tan works well with the bricks of this home. That tan color is in the same family of colors as the bricks of this home. A question we get asked quite a bit is, what does it look like when you use tan framing on top of white window framing, with some of that white window framing still showing. This picture here is a great example of this. It’s a perfect picture to show you exactly what the tan Framing and white window framing look like together. Take a look at that beautifully molded arched window there. Take a look at that arched solar screen that we made to perfectly follow the perimeter of this arched window. In this picture you’ll also see that we put metal turn Clips 30 in from the bottom of the window up on either the left and right sides of each of these screens. The screens were installed with the tracks that the windows have. We put leaf springs at the top of the screen to hold them into the top track. The screens have smaller lips at the bottom, for they are susceptible to coming out, so we clipped them. Put Center Clips there. 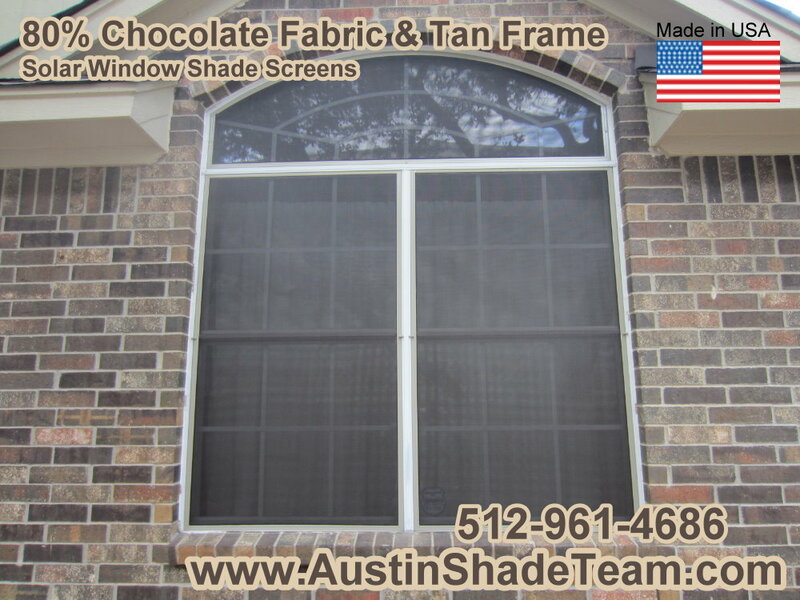 Solar screens from the Austin TX Shade Team can cool your home and help you feel relaxed all summer long. Once again, we manufacture, measure, and install each of our roller sun shades to custom fit your outdoor patio, door, or other space. With our roller solar shades, you can benefit from low pricing and high quality to provide comfort to your patio, porch, or pool area. Here’s a picture below, shows two 11 ft wide exterior roll down shades. These roll down shades, or sometimes called roll up awnings. They are not roll up or roll down awnings, they are roll up and roll down shades. 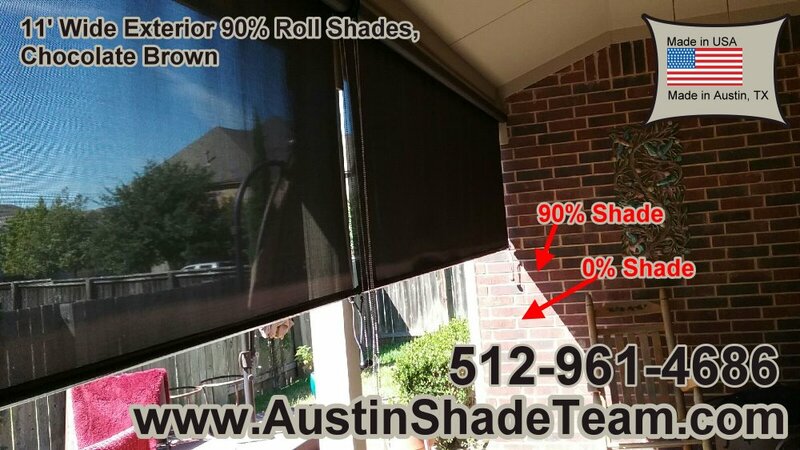 We made these roll down shades using our 90% solar screen fabric. When I installed these to roll down shades, I installed them so the clutches were back to back meeting there in the middle over that post. By me doing this it allowed for the resident, to roll the shades up and down while standing in one position, so they didn’t have to go to the left or right side of the shades to lower them or raise them. Also, by me installing these so that the chains dropped their over that post, the resident isn’t trying to pull that chain up and down against that brick wall there, which would rough up his Knuckles. 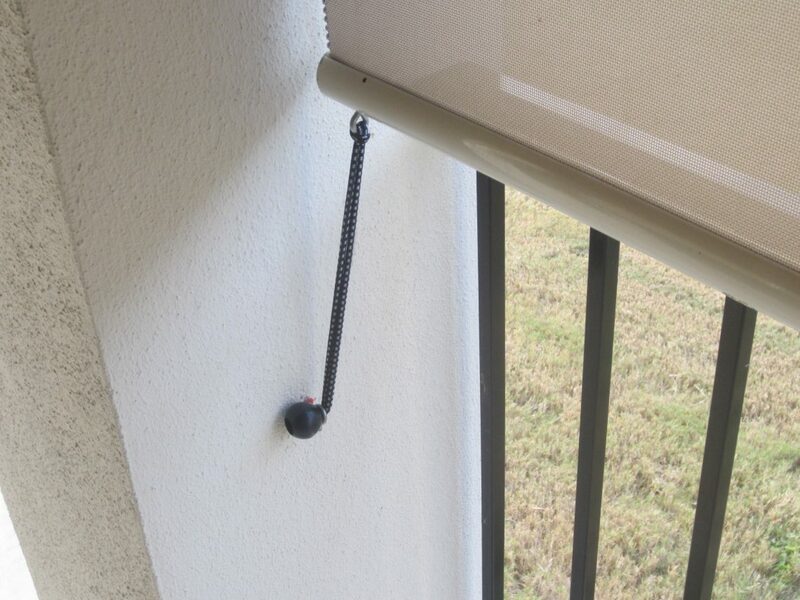 So by putting the chains there in the middle, it makes for the resident to be able to easily lower and raise these roller shades. Looking at this picture, there against that brick wall, is a great illustration of 90% shade versus 0% shade. Look up against that brick wall and you’ll see there written in red where it reads 90% shade, that area of the brick wall is shaded by our 90% solar screen fabric. The area where the sun is getting in, where the 0% shade is at, that’s not getting any shade. This is a huge difference. A huge difference from the 90% to the 0%. You can view our Exterior Patio Roll Shades Gallery to see more pictures. For this chocolate and black fabric we only have 90% as a maximum shading option. Now, if you are looking at are beige Fabric or the beige and white fabric we have the beige fabric in the 97% shade and the beige and white in a 92% and 97% shade option. So, if you want a lighter color, we can even give you more shade than this 90% shade. Dangling there from the bottom left and bottom right corners of the shade you will see some nine inch ball bungee cords. These bungee cords attach to hooks placed into the wall and that middle post. It’s by way of these hooks that you hold the shades down during the day. The shades have to be secured because when the wind blows, wind is very powerful, and this is a huge surface area, therefore these things can get really blown around. If these are not secured, they will get blown around, possibly knock over stuff that’s around them. While all these Shades can be secured, they are not intended to be down during strong winds. I can’t emphasize enough how strong the wind is when you have a huge surface area like this for the wind to push against. Also, these shades are only meant to provide temporary shade, shade for when you need it, not for all day everyday and to be left down all the time. If you leave the shades down at night when you go to bed and if you get a strong wind storm come through you could wake up in the morning with a problem. I say all this because it is just important that people understand how powerful the wind is. We’ll work with you to decide where to install your roller shades, what density fabric you need, and what color will match your home’s exterior. And, visit this page to learn about Pricing for our Roll Away Shades. You’ll always be satisfied when you choose the Austin Shade Team. We guarantee it.